Originally written for and marketed to consumers, The Land Buyer’s Guidebook can help you help your clients – while it keeps YOU out of expensive trouble. If you happen to be a new agent, read it before you begin showing raw land – and definitely before write your first land offer. It will help keep you out of court – and ensure that your reputation stays intact and your clients come back again. Remember, if you’re selling someone else’s listing to a buyer client, the responsibility is yours. Could be a Nightmare in Disguise! What You Don’t Know WILL Hurt you in a Land Purchase. Mr. & Mrs. E. wanted the seclusion of 5 acres in the country. They found a treed parcel with a sparkling little brook running across one corner. It was a dream come true. That is, until they started trying to get a home construction loan. After months of trying to correct the problems they faced, they sold the parcel at a loss and gave up the dream. Mr. G. spent about 2 years getting signatures on a petition to the County to allow him to build a commercial building on the expensive parcel he’d purchased. It didn’t help. The property had been marketed as commercial by the listing agency and both he and his agent had relied on that – much to their harm. Mr. & Mrs. S. thought they’d gotten a great bargain on their new riverfront home site – until they found out that all they had was an expensive camp site. In their case, there was nothing they could do that would satisfy the County and allow them to get a septic permit. These are all real people, and all of their problems could have been avoided if they’d asked the right questions and insisted upon the answers before they purchased their land. Sadly, until you’ve lost money or witnessed disasters, you don’t even know what to ask. In each case, the seller should have known and the Realtor should have known. Were they deceitful or simply negligent? I can’t answer that. I can only tell you that these things happen, and if you as a buyer don’t ask the right questions, they can happen to you. Read it before you go land shopping. Approach your next land buying transaction like an experienced land baron. With all the important questions at the ready, you won’t be fooled by appearances, and you won’t settle for vague or incomplete answers. 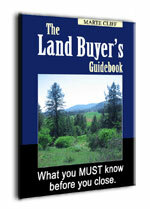 The Land Buyer’s Guidebook is priced at only $17.00. One thousand times that – $17,000 – could be only a fraction of the amount at risk. With land prices skyrocketing in many parts of the country, a mistake in buying land could easily cost you $50,000, $100,000 or more. What if you pay $150,000 for 20 gorgeous acres in the country with intentions of building a dream home… only to discover that you won’t be allowed to build on that parcel? What if you pay $50,000 for that parcel, build your home, and only then discover that it isn’t safe to let your children outside to play? Those are but two of the many problems you can encounter when you don’t ask the right questions. So don’t take chances with your finances or your future. Your investment of $17.00 today can easily save you a thousand times more than the price in your next land transaction. The kinds of problems you’ll avoid are expensive, and they’re YOURS once you sign the final papers. Here’s what one reader had to say about it: Your raw land book was definitely worth its weight in gold! If just one of your “watch out for’s” relates to a potential purchase – it could save a starry eyed buyer from losing $$ thousands of dollars! Thanks for sharing your knowledge and educating us!